Eggplant simmered with meat and tomatoes on long macaroni. I’m always mucking with the things I eat. Either it’s an undeniable sense of adventure (and the distinct possibility of abject failure for dinner) or I’m just too stubborn to have a recipe dictate to me. Let’s say it’s the former and leave it at that, shall we? skinny ones. Just purchase one that isn't too big. Bolognese sauce is an Italian meat-based sauce for pasta which originates in Bologna, a city in Northern Italy. A true Bolognese sauce includes a small amount of tomatoes or tomato paste in a rich sauce with meat and other ingredients. 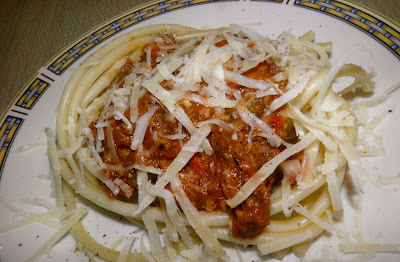 It tends to be served on thick pasta, as larger pasta shapes hold meat much better than finer pastas such as capellini. Variations on the sauce outside of Italy often include much more tomato and vegetable ingredients, which change the flavour profile considerably. Bolognese is essentially a ragu (meat sauce), and in Italy this sauce is called “ragù alla Bolognese” (meat sauce from Bologna). Throughout the country there are many other ragù, some named for locations, of equal deliciousness. Since Bolognese has so many variations, and mine sticks to the script fairly well, I deemed it appropriate to name mine as I did, even though it could also be called eggplant ragù. The technique to make this is very straightforward. Aromatic vegetables are sautéed in oil and/or butter. Then meat, cream and wine are added, then tomatoes, and the whole is simmered slowly for a couple hours until the vegetables are broken down and the sauce becomes thick. almost all of the liquid evaporate. Cream may seem like an unusual ingredient with wine, but it helps tenderize the meat via lactic acid. The wine does its part in that regard too. 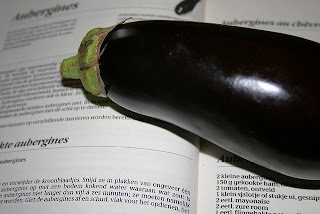 In my version I introduced an odd vegetable to the mix, eggplant. Although used throughout Italy, it originally was associated with southern Italian cuisine. Bologna is in the north. Eggplant has a rich taste all on its own, so I thought it would be a good gamble to take in making a sauce that was rich to begin with. What could it hurt? Well it didn’t hurt at all. 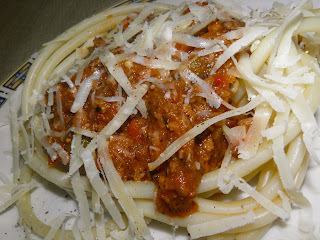 The eggplant added a level of complexity I have never had in any other Bolognese I have made. I did break one cardinal rule. I added herbs. Classic Bolognese has no herbs, believe it or not. I really don’t think it would have been as good without them. The eggplant demanded their companionship. Bolognese is not a quick recipe. It should simmer for 2 hours, at least. 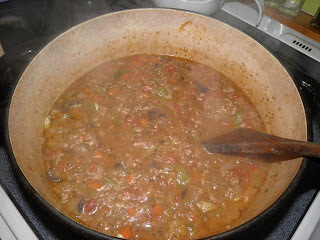 The vegetables need to break down to thicken the sauce, and that takes time. By the way, if you're feeding fewer than six people this ragù would make an excellent lasagna meat sauce. So you could "cook once, eat twice." Serve with broad, flat noodles or tube shaped pasta – never spaghetti. According to the experts, serving bolognese with spaghetti has been said to be a sign of lack of understanding about Italian cuisine. So there. Heat the oil in a Dutch oven. Dice the onion and carrot and add to the oil. Peel and crush the garlic and add. Sauté for few minutes until fragrant. Add the hamburger and sauté, breaking the meat up with a spatula as it cooks. Cube the eggplant and green pepper. Add both to the pot, along with the tomatoes and their liquid. Pour the milk and white wine on top and mix well. Add the remaining ingredients, stir and cover the pot. Reduce the heat to medium low and let cook for about 2 hours. Stir occasionally to avoid the mixture from drying out and sticking. If it does get too dry before 2 hours, add a little water. The end result will be thick with very little liquid. Taste and adjust seasonings. Serve on pasta that has enough body to stand up to the sauce, like tagliatelle, fettuccine, rigatoni or penne. I used long macaroni.